It's been 3 years since our 15-person panel took a stab at choosing the best stocks in the world. They were asked 2 questions, one of immediate consequence, the other more long-term. Those that have performed superbly include Visa, Apple, and Honeywell. Kinder Morgan and Gilead Sciences have hit the skids. 1. If you could only own one company in your portfolio, which would it be? 2. If you had $25,000 to invest TODAY on one company and you planned to hold it for 10 years or more, which company would you buy? They have many parts of the world to still penetrate, and they continue to make great business decisions. The current yield isn't great, but the dividend growth is amazing. They're still trading at a decent valuation. Eventually, they're going to settle into being a solid long-term income play; when they do, I want to have my shares purchased long before people start depending on them for yield. As for Visa being a "decent valuation" back then, Scott turned out to be right, as it has traded at much higher multiples since. Turns out you often have to pay up for quality. Who knew? There were plenty of other big "winners" selected by the panel of contributors and frequent commenters... and also some selections that haven't worked out as well. I wrote a three-part series back then, with Part 1 focusing on Question 1, Part 2 on Question 2, and Part 3 serving as both a wrap-up and a forum for my own selections. The series, which included detailed reasons for each panelist's choices, struck a chord with investors - combining to draw about 150,000 page views and 1,800 comments. Obviously, we Seeking Alphites value community sharing. Adam Aloisi: Honeywell (HON), Berkshire Hathaway (BRK.B). Buyandhold 2012: Johnson & Johnson (JNJ), Gilead Sciences (GILD). Chowder: Realty Income (O), Gilead. David Crosetti: Reynolds American - since acquired by British American Tobacco (BTI), Cognizant Technology (CTSH). Eddie Herring: Coca-Cola (KO), Apple (AAPL). kolpin: Johnson & Johnson (both questions). Eric Landis: Coca-Cola, Chevron (CVX). Paul Leibowitz: Coca-Cola, Johnson & Johnson. Tim McAleenan: Nestle (OTCPK:NSRGY), Berkshire Hathaway. Regarded Solutions: Johnson & Johnson, Exxon Mobil (XOM). Brad Thomas: Realty Income, STAG Industrial (STAG). Nicholas Ward: Disney (DIS) (both questions). Bob Wells: Kinder Morgan (KMI), Ventas (VTR). Yours Truly: Altria (MO), Johnson & Johnson. After presenting the data tables, I will make some observations. But I'd be remiss if I didn't emphasize an important caveat: This was never set up as a "contest." 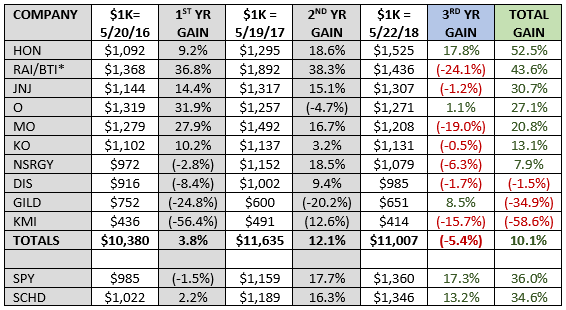 In the tables below, companies are listed in order of how much each would have gained (or lost) through May 22, 2018, had $1,000 been invested at the closing price on May 22, 2015. Those statistics were obtained using the Dividend Channel calculator and include reinvested dividends. Also included is information for two benchmarks: SPDR S&P 500 ETF (SPY) and Schwab U.S. Dividend Equity ETF (SCHD). Question 1: If you could only own one company in your portfolio, which would it be? Question 2: If you had $25,000 to invest TODAY on one company and you planned to hold it for 10 years or more, which company would you buy? As the bull run has progressed, it has gotten difficult for many individual stock investors to beat a market dominated by Big Tech and other outperformers. 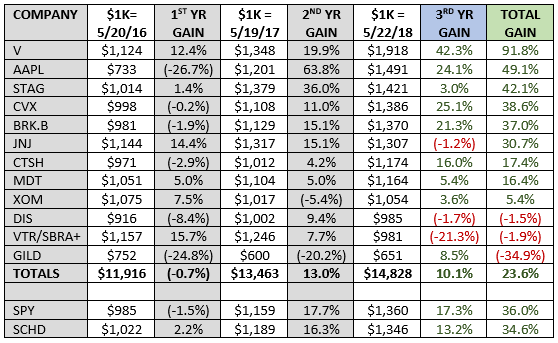 The panelists' combined selections did top SPY in this project's first year and were only a tad behind after 24 months... but they couldn't match the market's 36% gain over three years. SCHD, an ETF favored by Dividend Growth Investing guru David Van Knapp, also has done very well. 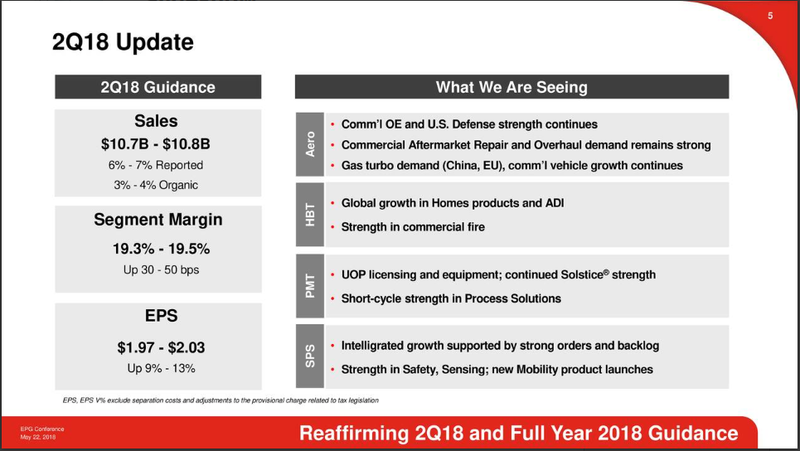 Only two answers to Question 1 have beaten SPY through this entire stretch: Honeywell and Reynolds (since acquired by British American Tobacco). If one is going to put all their eggs in one basket, I think you need to consider owning something that provides reasonable upside potential but isn't likely to crater due to a niche business focus, uncontrollable input cost dependency or sudden customer change of habit. In other words, something well-established yet potentially forward-nimble. Honeywell fits that criteria. Dave Crosetti selected Reynolds back in 2015 in part because he was excited about its impending merger with Lorillard. Little did he (or anybody else) know that RAI would be an acquisition target two years later. 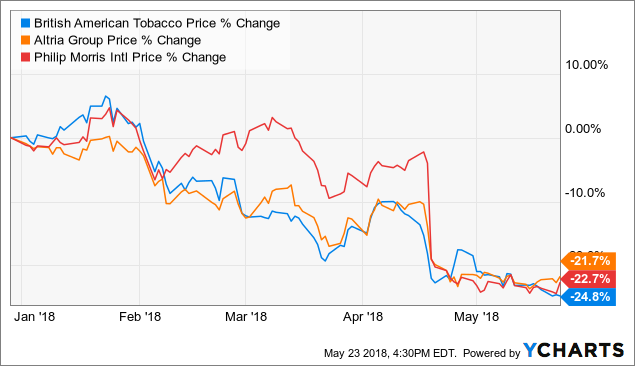 While Reynolds was the top performer in this project after two years, with an 89% gain, 2018 has been a rough go for BTI and the rest of the tobacco industry. Despite staples' struggles, it is important to note that dividends have continued growing nicely for beleaguered names such as Altria, Coca-Cola, and Nestle. Although 7 of the 10 selections for Question 1 actually suffered losses over the past 12 months, the choices for Question 2 fared much better. 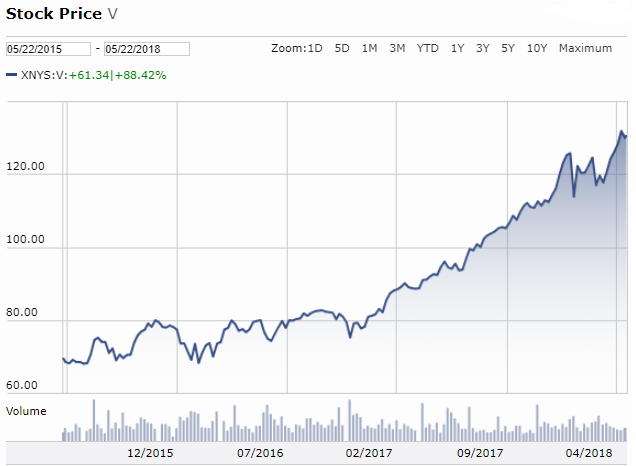 Visa led the way with a 92% gain over the past three years, including 42% just since last May. Making things twice as nice, V also hiked its quarterly dividend from .165 to .195 in December... and then again to .21 in March. That's a total increase of 27%. Hello! 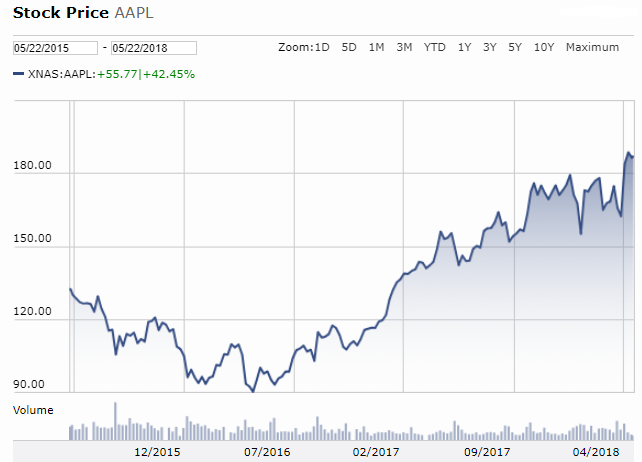 Apple, selected by Eddie Herring, followed its incredible 64% gain of the previous year with a 24% move these last 12 months. And to think, it had been this project's second-biggest loser after one year, down nearly 27%. That goes to the heart of Question 2. With a mandate to buy-and-hold for a decade, the thought process was different for some panelists. That's why it's impossible to declare any stock - or even SPY - a "winner" or "loser" after only three years. Chevron is diversified across the energy business and, even during the downturn, is increasing production and processing capacity into the future. With a 27-year track record of dividend increases and management prioritizing dividend returns to shareholders, I expect plenty of increases in the years to come as crude prices rebound and cash flows rise once again. After a small loss in Year 1 of this project, CVX has gained 39%, including 25% the last 12 months. Berkshire Hathaway, Warren Buffett's company that is famous (or infamous) among the DGI crowd for not paying a dividend, was nonetheless selected by two panelists. And similar to Chevron, it has followed a slow start with an outstanding last two years to also best SPY over the 3-year period. The two big laggards were Kinder Morgan and Gilead. KMI not only saw its price tank during the oil glut but its promise-breaking management slashed the dividend by 75%. 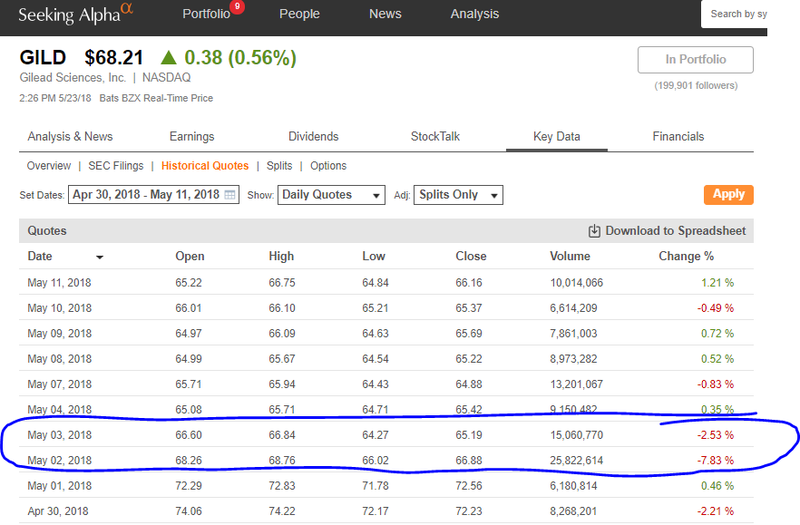 As the above graphic from Fidelity.com shows, KMI is only now starting to grow its dividend again. Its price is still languishing. GILD, meanwhile, has been unable to bolster its drug pipeline, much to Mr. Market's dismay. The dividend the company initiated in 2016 isn't of much solace to shareholders who bought when the price was over $100. Things actually were looking a little hopeful for Gilead just a few weeks ago, but a poor earnings report after the close on May 1 sent the stock tumbling by more than 10% over a two-day span. Though this was never intended to be a contest, I do believe in giving thumbs-ups where warranted. Scott U's Visa-Realty Income combo went up 59.5% over the past 3 years, crushing SPY. It's also hard to argue with Adam Aloisi's market-beating Honeywell-Berkshire duo, which appreciated 44.8%. I took my sweet time, but last year, I did finally say "damn the valuation, full speed ahead" - and bought both HON and V as well as two others I had wanted, Costco (COST) and NextEra Energy (NEE). I haven't been disappointed, and I since have added to all four. That touches on the main reason I like to cultivate collaborative projects like this: I think it's valuable to share investment candidates and thought processes. Thanks to the 15 panelists for taking part and to those who have taken time to read and comment, too. Disclosure: I am/we are long HON, JNJ, O, MO, KO, GILD, KMI, V, AAPL, CVX, XOM, VTR, COST, NEE. I wrote this article myself, and it expresses my own opinions. I am not receiving compensation for it (other than from Seeking Alpha). I have no business relationship with any company whose stock is mentioned in this article.